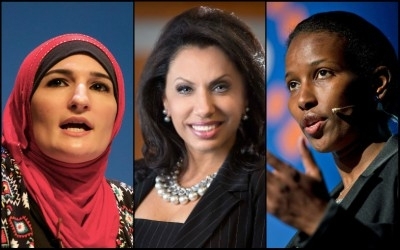 Muslim American activist Linda Sarsour (left) says she believes in non-violence, and that women who criticize her, such as Brigitte Gabriel (center) and Ayaan Hirsi Ali (right), should have their vaginas taken away. A recent speech by Palestinian-American Islamist Linda Sarsour, invoking the word "jihad" against "fascists and white supremacists and Islamophobes reigning in the White House," has created a political storm, involving the double meaning of the word "jihad." While supporters of Donald Trump read it as a call for violence against the American president, Sarsour, who made the comment in a speech to the Islamic Society of North America (ISNA), was quick to clarify she was ... advocating "jihad" solely as a form of peaceful, nonviolent dissent. ... [But] Sarsour is no Tess of the d'Urbervilles. Her activism and language hardly appear to reflect the non-violence of Gandhi. ... This brings us to the larger issue of "jihad" and what it means, given its various interpretations. On that score, there is a simple way out of this controversy. Prominent Muslim activists and Islamic groups should explicitly denounce the doctrine of "armed jihad" as no longer applicable in the era of the modern, nation state. Few, if any, Islamic scholars, clerics, or political activists, have done so. Muslim leaders should explicitly denounce the doctrine of armed jihad as not applicable in the modern era. By contrast, as far as ISIS, the Taliban, Al-Shabab, Boko Haram and other Islamist terrorist groups are concerned, they invoke the Qur'an, verse 9:5, to justify their jihad. It reads: "But when the forbidden months are past, then fight and slay The Pagans, wherever ye find them. And seize them, beleaguer them, and lie in wait for them in every stratagem (of war). But if they repent and establish regular prayer [accept Islam] and practise regular charity, then open the way for them; For God is Oft-forgiving, Most Merciful." The first of the major treatises on armed jihad was published by Abdullah bin al-Mubarik (d. 797). In his book, Kitab al-jihad, he documents the various stages of jihad and levels of martyrdom, noting, for example, that when a sinner dies fighting in a jihad, God forgives all his sins. It's time for some Muslims to come clean and to replace duplicity with honesty, in addressing the issue of jihad. Unless of course, they fit the role ascribed to them by Meira Svirsky, editor of the Clarion Project, who suggests Islamists today are the "doublethinkers" from George Orwell's 1949 novel, 1984. That is, they, "tell deliberate lies, while genuinely believing in them ... forget any fact that has become inconvenient ... repudiate morality while claiming it ... forget whatever it was necessary to forget, then draw it back into memory again at the moment when it was needed, and then ... promptly forget it again."